From only $8.95 - Continuous Repricing at a fraction of the cost. Maximize your profits. No Credit Card Required. Why Amazon Repricing from Seller Republic? Fast, safe, reliable and secure. Built with a carefully thought out infrastructure that balances ultimate reliability with the speed and performance necessary to ensure you consistently reprice in time and ensure you maintain maximum profits even when competing against rival repricing software. Continuous Repricing. Fast, yet solid and reliable performance. Built with Ultra Secure Security & Rock Solid Reliability. Our secure technology ensures you never reprice below or above your minimum and maximum prices. Lightning fast in app performance. Incredibly Easy to Use - 3 Minute Set Up Time! Tried and tested by professional Amazon Sellers and built with extensive usability testing. A true 3 minute set up when using our carefully configured presets (excludes Amazon connection and update time). Bulk or individually set Min/Max Prices in app or via CSV. Assign strategies to individual, multiple or entire inventory in a click. Intuitive instant listing search capabilities. Reprice up, down and match intelligently to ensure maximum profits not just sales! Seller Republic understands that repricing is about maximizing profit not just maximizing sale numbers. Intelligently reprice up and down dependent on your competitors actions. A built in win buy box strategy as standard and the possibility to set an infinite number of new strategies depending on your goals. In built ‘Win Buy Box’ strategy. Compete with Buy Box Owners or Lowest Price & Set Rules for when to not reprice. Reprice up, down and match as standard. You can even set your Prices to rise once the competition goes out of stock, thus maximizing profits. Set an unlimited amount of your own strategies. Make advanced additional pricing rules. Perfect for Amazon Global Sellers, add multiple seller accounts per subscription, all for the same price, including UK, USA, Canada, Germany, Spain, France, Italy, India and Japan. Inbuilt Win Buy Box rule aggressively seeks and automatically captures you the buy Box, winning you the all important top spot where 80% of Amazon sales are generated. Reprice an entire Amazon account in minutes, however many listings you have! Bulk Apply Strategies. 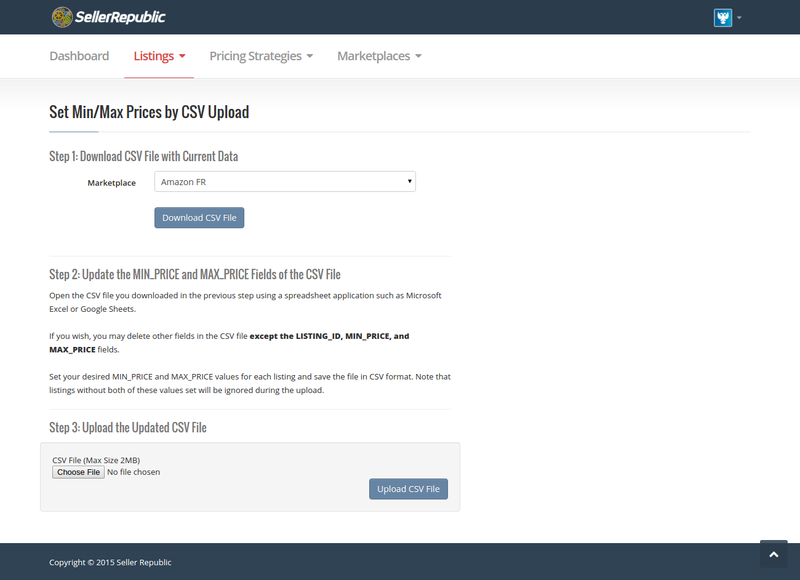 Set Min and Max Prices individually, in bulk by percentage of cost or current landed price, or by CSV Upload. Push the Amazon API to the limits and utilize the safe maximum capacity of the Amazon set up. Continuous Repricing offers the optimum level of security and reliability, whilst pushing to the absolute heights of safe performance. *Included with all plans as standard. Be safe from potential listing errors with our ultra secure technology which is monitored around the clock. In built safety measure ensure it is impossible to reprice outside your preset min and max prices. Our users gain an average 50% increase in sales and 40% in profits because we not only reprice down, we also match and increase prices too against FBA and non FBA sellers! We have an in built Win Buy Box Strategy and you can add a never ending amount of unique strategies/rules too. 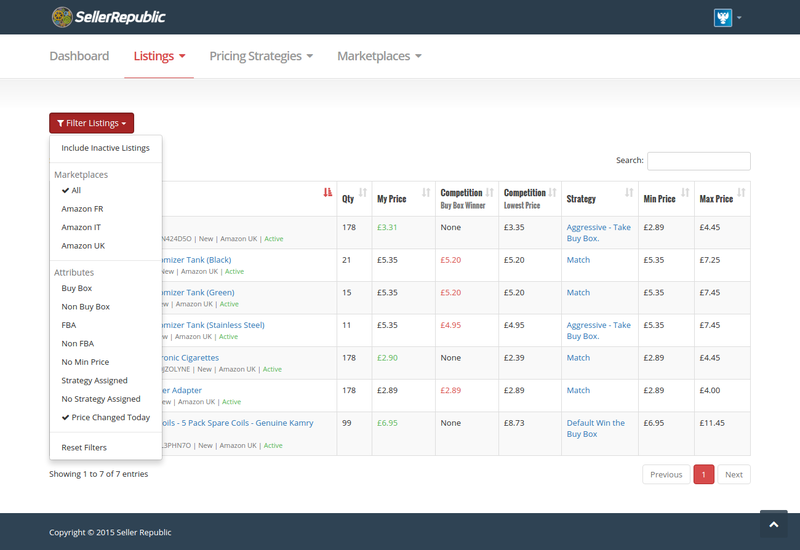 You can access Seller Republic from multiple locations simultaneously. 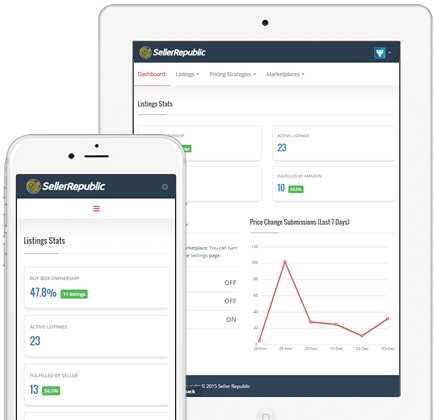 Seller Republic is fully responsive for whatever device you are using. All subscription levels are fully compliant on PC, Laptop, Tablet and Smartphone. We download all your listings into our system so when you search they are viewable instantly! Predictive search means we show listings intelligently to what you type! Although Seller Republic Amazon Repricing has been designed to be as easy to use and intuitive as possible friendly email and in app Chat Support are available just in case you need us. You can assign pricing strategies to your listings and get them ready without actually sending the updated prices to Amazon. Turn Repricing on and off by marketplace in a second and flick of a switch. Narrow down on your re-pricing history on a per product basis, enabling you to keep a strong eye on your most profitable lines and how competitive repricing is upon them. Fully reprice not only just Fulfilled by Merchant (FBM) listings but Fulfilled by Amazon listings too. Dynamically compete with strategies that act differently depending on whether you are competing with FBA (Fulfilled by Amazon) or FBM (Fulfilled by Merchant) sellers. Reprice on autopilot, once set up simply leave the hard work to us as we reprice for you 100% accurately without the need for any of your attention. We monitor Amazon automatically via our cloud based system through automation around the clock to ensure nothing is missed. Analyze the Competition & Stats on your dashboard instantly by graph and numbers. Break down your stats by Buy Box percentage as well as showing the number of changes we make day on day. You can even delve deeper and check which products are actually being repriced that day! All our plans have a free 14-day trial. No credit card required. A well thought out solution that gets the job done fast. 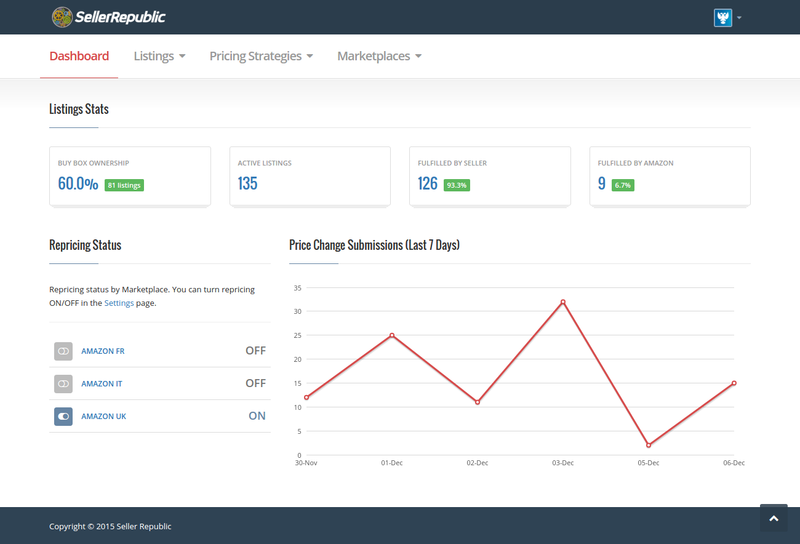 After previously using Repricers which consistently fall short, it is refreshing to use Seller Republic and find a service that not only works setting it up was a quick too. Once set up it has simply ran on autopilot with a few quick glances to the dashboard. We found the most value we got from Seller Republic is when listings price up, something which is often overlooked when repricing manually. An increase on certain lines from a 10% profit margin to over 70% whilst still maintaining the same sales volumes has added greatly to our business. Try our 14-Day Free Trial! Zero set up fees, long-term contracts or commitments. No credit card required. Cancel anytime. Try Seller Republic for free. Short of time to sign up now? Subscribe to our email list below to keep updated with the latest news or contact us to schedule a demo at a later date.